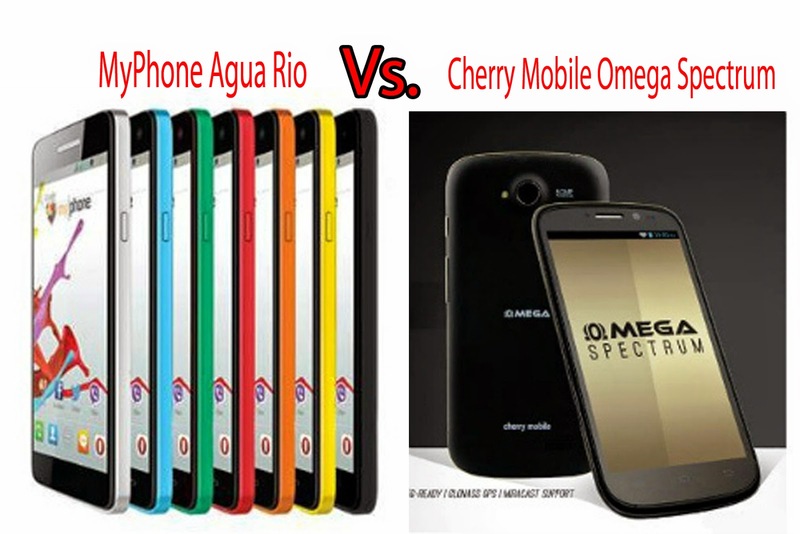 Myphone and Cherry Mobile releases their quad-core smartphones for summer- the Agua Rio and the Omega Spectrum. They have the same tagged price at Php4,999. The two smartphones has almost the same specs, they both have 1GB of RAM, 4GB internal memory that can expand up to 32GB via microSD, 8 megapixel rear camera with LED flash and 2 megapixel front facing camera, powered by a 2,000mAh battery and running Android 4.2 Jellybean. . They also the same supports USB OTG, Wifi, Bluetooth, HSPA, 3G, and GPS. The Myphone Agua Rio has slightly higher CPU at 1.3Ghz Mediatek MT6582M quad-core while the Cherry Mobile Spectrum has an 1.2GHz Broadcom BCM 23550 quad-core processor. They have also the same 5-inch HD IPS display at 294ppi but the Spectrum packs Dragontrail glass and supports Miracast.